The International Baccalaureate (IB) offers high quality programmes of international education to a worldwide community of schools. There are 5,000 IB schools in 153 countries. In 2017 alone, there are more than 174,000 candidates taking the IB diploma-level exam. [Quoted from http://www.ibo.org on 8-April-2019]. The International Baccaulaureate Organization aims to develop inquiring, knowledgeable and caring young people who help to create a better andmore peaceful world through intercultural understanding and respect. IBDP stands for International Baccalaureate Diploma Programme. The Diploma Programme is a challenging 2 year programme of international education for students aged 16 – 19. It leads to a qualification that is widely recognized by the world’s leading universities. Thinkers They exercise initiatives in applying thinking skills critically and creatively to approach complex problems and make reasoned decisions. Open-minded Through an understanding and appreciation of their own culture, they are open to the perspectives, values and traditions of other individuals and cultures and they are accustomed to seeking and considering a range of points of view. Well-balanced They understand the importance of physical and mental balance and personal well-being for themselves and others. They demostrate perseverance and self-discipline. The IB diploma is widely recognized by more than 2500 universities, with 77% of diploma programme students admitted to their first choice universities. More than 100 universities worldwide offer scholarships for IB diploma recipients. Students applying to a particular university may grant permission for their grades to be accessed directly from the IB’s secure website, making tertiary application convenient and efficient. 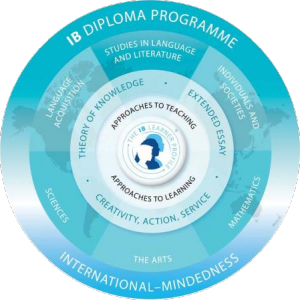 More information about the IB Diploma Programme is available Here .